Tribeca Advanced Dentistry New York is happy to offer Invisalign® to our patients. Unlike traditional braces usually made of stainless steel by an orthodontist, Invisalign® uses a modern approach: invisible set of smooth and transparent aligners created just for you via a computer-aided manufacturing process precisely based on the treatment plan supplied by our cosmetic dentist. You wear Invisalign aligners over your teeth – others may never even find out that you are trying to straighten your teeth. You come to our New York office approximately every two weeks to make sure your treatment is going according to plan and pop-in a new set of aligners gradually approaching a perfect shape for your teeth. There is no need to tighten your braces, painful irritations caused by loose wires, and Invisalign can be easily popped in and out of your mouth to brush your teeth or while you eat. While aligners are created and manufactured by a computer and thus offered by a large number of dental practices, it’s helpful that your dentist has advanced training in Orthodontics or Prosthodontics, or has taken a number of continuing education classes as proper treatment planning is still very important. 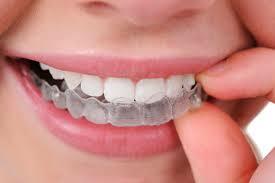 Our Tribeca dental office offers Invisalign as a separate service or could be part of overall “smile makeover“. I highly recommend that you familiarize yourself with how Invisalign works. Please contact our Tribeca Advanced Dentistry Office to see if Invisalign is a good choice for you. While your insurance may not cover Invisalign treatment, we recommend that you try to enroll in Flexible Spending Account (FSA) which will cover for up to $2,500 of the cost. Contact prosthodontist Dr. Olga Malkin to set up your Invisalign consultation.